Best selling high horsepower stainless steel propeller in the world. 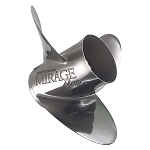 Large diameter and large blade area for outboards and stern drives on cruisers, light or heavy high-performance boats. Excellent holding power in turns and rougher waters. V-6 outboard offshore fishing boats to Bravo 1 sterndrive vee-bottom sport boats, cruisers and race boats, the Mirage Plus prop does it all quickly. Specifically designed to handle high horsepower. 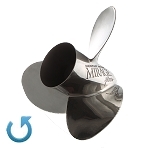 Improves acceleration and top speed on many boats. Flo-Torq II SS (Solid) hub kit 835258K2 is available as a separate purchase for outboards over 150 HP on offshore fishing boats, Bay boats and V-bottom sportboats. Get it now! Ships same or next business day. Last one!